Bigfoot is real. Yancy Lazarus - mage, bluesman, and rambler - knows because there happens to be a nine-foot-tall, walking myth standing in the road, flagging him down. Yancy just can't escape his reputation as a supernatural fix-it man even when cruising through the forgotten backwoods of Montana. Turns out Bigfoot has a serious problem on his hands: one of his own has gone rogue, developing a taste for the flesh of humans and Sasquatch alike. 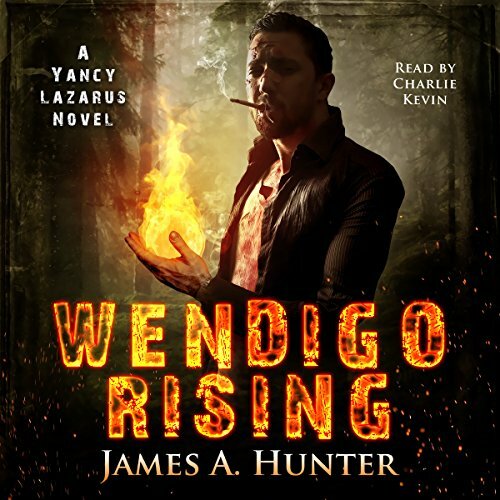 A greater Wendigo has risen for the first time in thousands of years and if Yancy can't stop the creature it could be a slaughter for the residents of a rural Montana town. But even with the monstrous threat looming on the horizon, Yancy has bigger fish to fry. 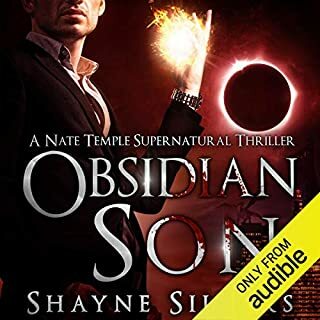 He's working as an agent of Fate, attempting to put the kibosh on a nefarious scheme, aimed at upsetting the tenuous balance between the supernatural nations. When your boss is Lady Luck, however, nothing is ever left to chance, and his two cases may have more in common than it appears. If he can't figure out the missing link it could usher in a new world order: an age of inhuman creatures and walking nightmares...one where Yancy Lazarus doesn't exist. ©2015 James A. Hunter and Shadow Alley Press, Inc. (P)2016 James A. Hunter and Shadow Alley Press, Inc.
Can you smell what the Wendigo is Cookin'??? I really, really, really want to see a meeting between Sandman Slim and Yancy Lazarus. They have so much in common that they would just hate each other. I know I have said it before, that he out Harry's Harry Dresden, and while it is true I believe deep in my soul that he'd make a great companion for Stark right up until they tried to kill each other. Speaking of Dresden, you may have seen that he had three short stories about Bigfoot. All three were stinkers in my opinion. They have been the weakest of the Dresden Files. Conversely, Yancy's tale about Bigfoot is a rocket ride into insanity, the fun kind, not the explodey sad kind. No, the tale of a rampaging Wendigo alone would be enough for me to endorse this book, but wait. . . . there's more!! There are actually 2 tales that mesh and interwine (sadly for Yancy) that leave our hero in a serious bind. It seems that these two seperate events may not be so seperate either, and that Yancy is in more danger than he knows. My appreciation of Yancy improves with each book. I just sort of fell into Urban fantasy, and thankfully got lucky with Yancy being there to carry the Urban load, so to speak. Hunter really elevates the genre, and rethinks it with every novel. The books and Yancy continue to improve with every release, and sets a bar for the next book to climb over. So far, I see no sign of this series slowing down or getting stale. Kevin is solid in his narration, sometimes he gets a little quick, but that is the emotion coming out. He knows how to pace action, and his cadence is perfect. Even though I did receive a promo code for this review it in no way influenced my considerations of the material, and in fact, inspired me to be more honest. In fact, getting a code generally makes me harsher as a reviewer as I am more often concerned what someone like Me will decide based on my review. Yancy is good all the way all the time! Yancy… sigh. Be still my beating heart. Yancy is my new Harry Dresden. Yancy still drinking, smoking, gambling and swearing to much but can still wield the mist. Even when faced with the legendary Bigfoot people, Yancy faces the situation with caustic charm while wielding fire. Yancy makes new friends (Bigfoot people) while trying to deal the betrayal of another. The action is always the best when Yancy has tired himself and everything is on the line. He always has one more thing to pull out of his hat. If you have not read a Yancy novel and are a fan of Harry Dresden, you will like this. I'm writing this review having completed all five books available as of this writing. Bottom-line: this is a good series, hits all the right UF buttons. It won't let you down. 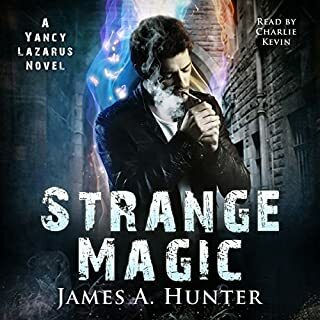 In the third book of the Yancy Lazarus series Mr. Hunter comes out swinging with new ideas, new characters, more of Yancy's world and Yancy's fascinating magic. This series always had a sense of humor, but this volume takes that up a notch without losing any of it's gritty, tough qualities. Great fun, great narration, this was immediately my favorite book in the series so far. 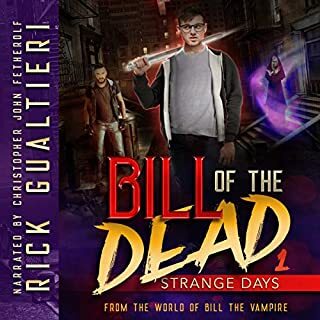 If you enjoy books like the Dreson files this is right up your alley. Likes: magic, mythical creatures, mystery, the blues, music, not smutty romance but still has romance at the edges. Dislikes: The language is very rough most of the time. It was ok for me but not a book for kids or those easily offended. I can't believe that I lost this in my TBR pile! Yancy Lazarus is a mage, ex Marine, a fixer, nobody to mess with, and the king of snark. This time he is called upon by the chief Bigfoot to contain a major problem. Lots of twists, action, amazing knowledge of multicultural lore, and the best kind of thrill ride! The publisher's blurb gives hints and clues, and there is no need for spoilers here. The characters certainly are and the plot is fast moving. I love it! Charlie Kevin is more than well suited to the role of narrator for Yancy. He's got the attitude, cadence, and super snark down to a science. 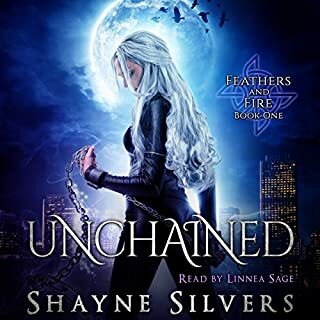 Someone is playing a long game and Yancy is the instrument of fate, maybe..... Now off to read book four with a side of I cannot wait for the Audible of said book... Because Charlie Kevin rocks as our narrator. I love fantasy and this series was excellent as well as one of my favourite performances. 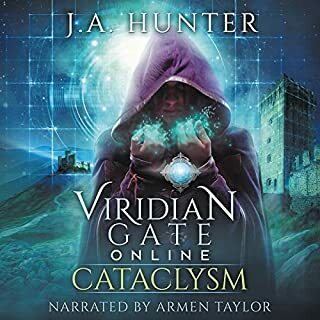 I read the summary, then reviews, and listened to the sample narration, the latter making the sale for me. The author's superb writing skills are a perfect fit with the narrator's performance. 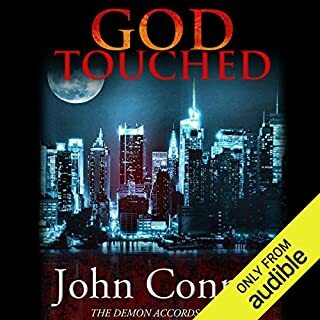 Tough guy, no nonsense, engaged with other fascinating characters of the same ilk, and entertaining dialogue with a twisting plot...I listened to this book in one sitting. Captivating, and though the book ended, I am adding all of this series to my wish list. Great series. The narrator iis spot on. Amazing characters and perfect plot twists. Big fan. Read this. Better yet get the audio book. Can't wait till book four comes. Thank you Mr. Hunter.